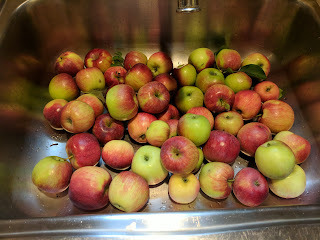 Two of my neighbors have apple trees and they both have given me apples in past years. This year, one of them got a bag full of peaches and they plan to give me some of their apples in return; theirs are like Granny Smith apples and they're great for cooking. My other neighbor contacted me last week and suggested I come and pick some of their apples, which are more like Macintoshes. Two years ago my apple jelly made from their tree's fruit won first place in its class at the Fair. I'm hoping that works in my favor again this year! I quartered them all and cooked them with some water in two large pots and then let them drain over cheesecloth to get the juice. I ended up with a little more than two quarts of juice. The solids were then passed through the food mill to make applesauce. For three quarts of applesauce I used 1.5 cups of sugar. I did contemplate adding my honey instead, to make this super-uber-local applesauce, but I couldn't bear to part with what little honey I have for something that would mask the taste. Tomorrow I will take the juice and make jelly. I need 7 cups, and I have about 9 cups. Not sure what to do with the rest, except maybe add some sugar and can it just as juice. We'll see.